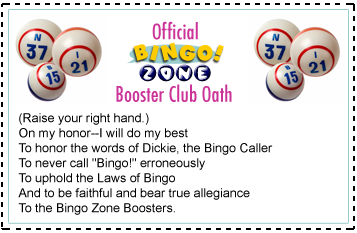 Welcome to the Bingo Zone Booster Club, the home for the biggest Bingo fans on Gamesville! Join today and receive your membership certificate, special badges, email updates, and more. Meet Dickie, the Bingo Caller! Check out the Bingo Zone Store for all of your Bingo apparel needs. Subscribe to the Gamesville Times, featuring a special column for the Bingo Zone Boosters. 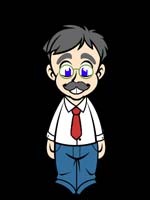 Just log in to your Gamesville account, click "edit account info" and click "Gamesville Times" under "Marketing Preferences." View - and add pictures to - our photo album. Send us a video or a recording of you singing the Official Bingo Zone Song and win up to 500,000 GV Rewards! Coming Soon - Bingo Zone Boosters Message Board where you can chat with other players and organize real life meet-ups.